Born in France at Champigne, Henri Lebasque became known as a painter who spread “joy and light” and for works that were intimate in subject matter and pleasing in color and form. He was in Paris in 1885, when he was age 20, and there he studied at the Ecole des Beaux Arts and with Léon Bonnat, focusing on portrait painting. Soon he was exhibiting at the Paris Salons and art society exhibitions. He also assisted Ferdinand Humbert with murals at the Pantheon. 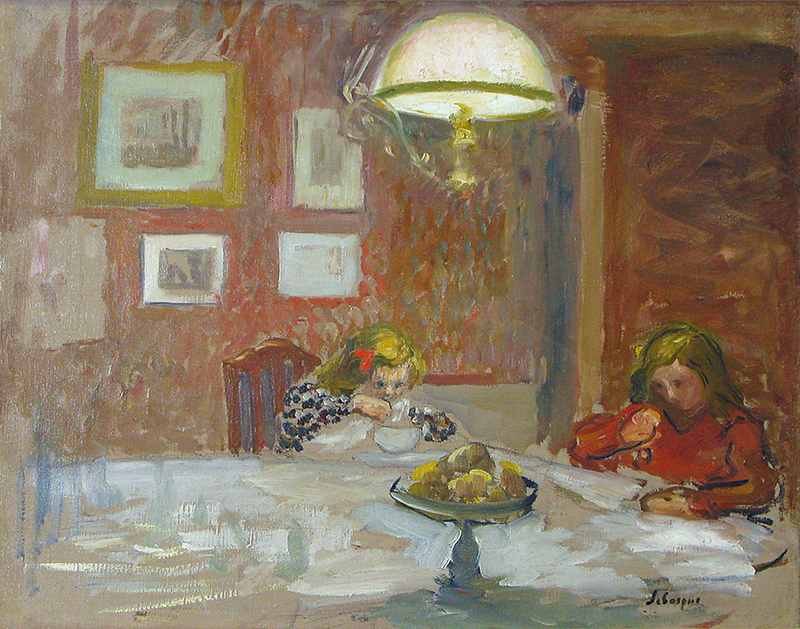 Of special influence on him were his peers, many whom were revolutionary young painters such as ´Edouard Vuillard and Pierre Bonnard and who were part of Les Nabis, a group of student artists who banded together at the Académie Julian and asserted that art was personal expression and not something done by outside prescription. Another group that influenced Lebasque were the “Intimists”, which also included Vuillard and Bonnard, and which espoused the depiction of cozy domestic genre scenes with jarringly modernist use of line and color. Lebasque, along with his friend Henri Matisse became a founding member in 1903 of the Salon d’Automne, whose exhibiting artists became known as Les Fauves (wild beasts) for their brash use of color and savage presentation of shapes. Lebasque adopted their flatness of shape and color but was more fluid in presentation than many of them. In 1924, Lebasque moved to the French Riviera to the town of Le Cannet, and he and Bonnard painted there together, often sharing a model. He died there in 1937. Museum collections include the Petit-Palais, Musée d’Art Moderne, Musée des Beaux Arts and the 1915 Panama-Pacific Exposition in San Francisco.